Dining out for a cause isn’t exactly a new thing ’round these parts, but sometimes the cause, the deal and the restaurant involved come together in a perfect storm that’s both tasty and inspirational. Tonight only (January 31) if you dine at Commissary, Logan Tavern, or The Heights, 10% of all proceeds will benefit the “It Gets Better Project.” All three restaurants are owned by the EatWell group which runs a charitable division called GiveWell. To RSVP to the event via Facebook, donate to It Gets Better Project, share your story or watch the infamous videos visit this site. From Mike Kohn. Got a tip? Send Mike an email. As reported by DCist and U Street Girl (who heard it through the grapevine themselves), it’s looking like the old post office at 14th and T Streets NW is bidding us adieu. Despite the lack of warm experiences at this particular branch, it has been pretty convenient to have one so conveniently located. The next closest ones are at 2300 18th Street NW and at 1921 Florida Avenue NW. At left, Andrew wears a Ralph Lauren rugby shirt, dress shirt from J.Crew and tie from Tommy Hilfiger. Khelan is in a blazer from H&M, oxford shirt from American Apparel and madras tie from J.Crew. Khelan Bhatia lives in the U Street area and recently started writing about style for Borderstan. Welcome back, Borderstanis, to my second column on style and fashion. I promise to do my best not to have a sophomore-slump, like so many of our favorite musicians. At the party, I kept thinking about Glee’s popularity and why it resonates with so many of us who haven’t seen the halls of our high schools in years. Why is it such a phenomenon? Is it the Broadwayesque renditions of pop songs we say we hate (but secretly love)? Well, sure. Who doesn’t want to hear what those kids do with Katy Perry or Lady Gaga or even Florence + the Machine? Mary Burgan is a retired professor of English and association executive. Her column now runs weekly and she will be reviewing current-run shows. You can contact Mary by email. I am not an Anglophile, and the PBS “Masterpiece Theatre” productions tend to make me yawn, so I went to see The King’s Speech with a load of skepticism. Not another bow to the British grip on American media drama from me. But I admired Colin Firth’s Oscar-nominated acting in last year’s A Single Man, and that memory lifted my expectations, though the sedate audience in the line to buy tickets at the E Street theater did make me anxious. (I am, by the way, a senior citizen myself). Well, The King’s Speech is a good movie, and I think Colin Firth ought to get an Academy Award for his work in it. Firth is wonderful at rendering the repressed pain of ordinary men, and it’s clear that George VI was an ordinary man pressed into extraordinary service as King of England during the rise of Hitler and the Third Reich. From Tom Hay. Questions for Tom? Send him an email. The Dupont Circle Village will hold their first major fundraising event, which will have the theme “Give Your Heart to the Village.” The silent auction will support the neighborhood non-profit organization devoted to enabling Dupont Circle residents aged 50+ to remain in their homes and community as they grow older. The Village, primarily through volunteers, aims to help residents retain their independence by providing help as needs arise regarding illness, disability, temporary hardship and home maintenance. Members of the Village pay an annual fee for access to the services and social events. Many local restaurants also offer discounts to members. There are currently 105 members of the Village. From Laura Herman. Got a weekend tip for Laura? Send her an email. You can follow Laura on Twitter @Lmhhabs. Assuming that we’re not all snowed in for D.C. Snowpocalypse 3.0 this weekend (and here’s to hoping), there’s lots going on in and out of Borderstan this weekend. 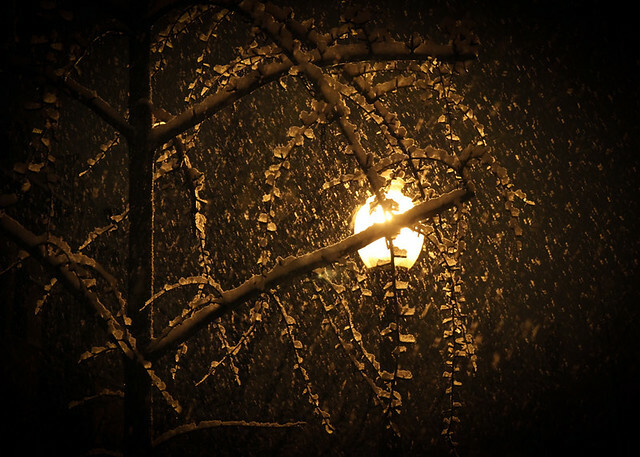 Got pics to share from last night’s snow? How about the Dupont Circle Snowball Fight? Share them in Borderstan’s Reader Pool on Flickr. About 200 people showed up Wednesday night at 8 pm for the first Dupont Circle snowball fight of the season. The heavy wet snow made for good fighting and there were plenty of media outlets on hand to cover the event (The Washington Post has video.) The Fojol Brothers were even there with some hot food. Add your snowball fight / snowstorm photos to the Borderstan Reader Pool on Flickr. The Washington DC Snowball Fight Association organized the event. The group got its start last winter during the February Snowpocalypse. You can follow the group on Twitter with hashtag #DCSFA. (Courtesy of Keegan Theatre at Church Street). Shadow of Honor is at the Keegan Theatre at Church Street, 1742 Church Street NW. Final performance is Sunday at 3 pm. Return to Haifa is at Theater J (DC Jewish Community Center), 16th and Q Streets NW. Last show is Sunday at 7:30 pm. At the Studio Theatre, 14th and P Streets NW: Marcus; Or the Secret of Sweet runs through Sunday, February 20. Showtimes are Wednesday, Thursday and Friday at 8 pm; Sunday at 2 pm and 7 pm. “What Was There To Be Seen” is an exhibition that focuses on the complexity of science and human biology as seen through the eyes of artists Carolyn Bernstein and Kindra Crick. Each featured artist uses different techniques while employing scientific and medical imagery to convey emotions, experiences, fantasies and fears. The exhibition at the Bronfman Gallery runs through April 24. We hope you didn’t miss the State of the Union speech last night. For those that watched, we hope you played this game and are reading this while ‘recovering’ at work. Time for the inevitable bread, milk and TP runs — apparently this storm is actually going to give us some snow! Let’s try to avoid this type of thing again, readers. Two weeks ago we talked with Borderstani Julie Mason, White House correspondent, dog owner and neighbor — and she gave us some interesting insights into Logan Circle. For the second in our series on Interesting Bordertanis, we talked with Miss Shi-Queeta Lee. We will continue to profile some of the unique, inspiring and downright interesting folks that are all around you in the place you call home. If you have yet to encounter the fabulous Miss Lee, you need to adjust your social calendar! You may have been entertained at TOWN Dance Boutique every Friday and Saturday (show starts at 10:30 pm). Perhaps your glimpse of her was at Nellie’s Sports Bar for Drag Bingo on Tuesdays at 8 pm or Drag Brunch on Sunday at 11 am. Check out Shi-Queeta’s slide show at the bottom of the story. She’s about to take the world by storm with her two shows for 2011 — “Spill Da Tea with Shi-Queeta-Lee”, a variety talk show on BlogTalkRadio, and Drag City DC: Hair and Paint Make a Man What He Ain’t, a reality show based on the Real Housewives series, but with six drag queens. The following is a list of robberies, assaults, stolen autos and burglaries in the Dupont-Logan-U Street area over the past week. Crimes are from police reports for Police Service Areas 208, 305 and 307. Friday, January 21, 12:55 am, 9th and T Streets NW. This month the website, Twitter account and Facebook page for the Urban Neighborhood Alliance (UNA) went live, and the newly formed community association for Dupont and Logan Circles quickly connected with residents and businesses. Membership in UNA is open to anyone who lives and or works in the Dupont and Logan neighborhoods. While there is no membership fee, donations to support their efforts are encouraged. Borderstan spoke with Lee Granados, president of UNA, about the goals and vision for the organization. Granados is passionate about the neighborhood she has known since her childhood and where she now lives with her family. In 1922, her grandfather, who emigrated from Spain, opened Casa Pena. It was one of the first international food stores in the District on 17th Street NW near R Street NW, where Salon Rouge is now located. Granados’s grandmother lived on Church Street NW until well into her 90’s before moving in with her eldest daughter; she lived to 103.